1,655 people read this post. UPON WHOM IS QURBANI COMPULSORY? #…..Qurbaani is compulsory upon every understanding, mature, resident Muslim male and female who owns nisaab or owns extra items (over and above their need) which equals the nisaab amount, i.e. they own an amount that equals the gold and silver nisaab amount, or they possess homes or properties besides the one they live in or they have extra household items that equal the nisaab amount or they have trading stock, shares etc. Then one share of Qurbaani is necessary for them to do. #…..It is not a condition for a year to pass over the nisaab amount or the items that are over and above ones needs. It is also not a condition for the goods to be trading stock. If a person becomes the owner of it before sunset of the 12th of Dhul Hijjah, then Qurbaani is compulsory upon him/her. #…..From the three days of Qurbaani, if a person becomes the owner of nisaab even on the last day, or he becomes the owner of goods that are over and above his needs, then Qurbaani becomes compulsory upon him. #…..If a person has a home other than the one he lives in, whether it is for trade or not, or he has a flat besides the one he lives in, he has a vehicle other than what he needs, then this person is a saahib-e-nisaab with regards to Qurbaani. Qurbaani is compulsory upon him. #…..If a person possesses trading stock – of any kind – that equals the nisaab amount, then Qurbaani becomes compulsory upon him. Rasulullaah (SAW) stayed in Madinah Munawwarah for ten years after Hijrah. He performed Qurbaani every year with punctuality. From this we learn that Qurbaani was not specific to Makkah Mu’azzamah, but it is compulsory upon the resident of every city that has the ability. Rasulullaah (SAW) used to emphasize it. It is for this reason that majority of the scholars say that it is waajib (compulsory). #….. Adha means Qurbaani. Youm-ul-Adha means the Day of Qurbaani. #….. By a small animal is meant a ram or ewe of a sheep or goat. #….. If a person who is a Sahib-e-Nisaab (one upon whom Zakaat is obligatory) purchases an animal for Qurbaani and passes away during the days of Qurbaani, the animal will then form part of the estate of the deceased and all the heirs will have a due share in the animal in keeping with the Shariah. The heirs now have a choice either to sacrifice this animal as Qurbaani and thereby allow it to be a form of Esaal-E-Thawaab or they can share it in keeping with the division of the estate. It should be noted that in the case of the heirs opting to sacrifice it for the sake of Esaal-e-Thawaab for the deceased, it is conditional for the heirs to all be matured. The permission of immature heirs is not reliable. #….. Qurbaani was Waajib on a person but all three days of Qurbaani pass without the person sacrificing an animal. He will then have to give in charity the value of a sheep or goat. If he had already purchased an animal for Qurbaani but was unable to slaughter for some reason, this living animal must be given away in Sadaqah. It the person sacrificed the animal after the days of Qurbaani had already passed due to ignorance of the rules, he will now have to distribute all the meat to the poor. Such meat cannot be given to a wealthy person. If the animal is destroyed and the person is unable to make Qurbaani and such a person is wealthy, it will be Waajib for him to give the value of the animal in Sadaqah. #….. A female goat is better than a sheep. #….. The Qurbaani of a ram is better than that of a ewe. #….. The Qurbaani of an animal which is more expensive is better and if the price of two animals is the same but the meat of one is better, it will be superior to choose that one. #….. It is not valid to make Qurbaani of a blind animal. #….. If there is doubt whether it is the twelfth or thirteenth of Zil Hijjah one should not delay till the third day of Qurbaani. In the case where there is a delay and one goes beyond the three days, it will be Mustahab to give the Qurbaani meat away as Sadaqah. #….. Qurbaani of sterile animals is in order because there is no command of impermissibility with regard to them and sterility is not considered a fault for Qurbaani. Just as a castrated animal, although being limited in its capacity, is not considered to be faulty for Qurbaani, so too, is a sterile animal not considered faulty for Qurbaani. In fact, sterile animals are generally more meaty and plump and the quality of the meat is also generally very good due to which Qurbaani of such an animal is permissible. #….. The Qurbaani of a mad animal is in order but if due to its madness, it is unable to eat and drink, its Qurbaani will not be valid. #….. By big animals is meant cows, oxen, buffaloes and camels both male and female. #….. It is permissible to slaughter a goat. #….. The condition for a goat is that it should be a year old. #….. There is only a single share in one goat. If two people get together and make the intention for both their Qurbaani in the same animal, neither person’s Qurbaani will be valid. #….. The Qurbaani of buffaloes both male and female is permissible. #….. The Qurbaani of a squint animal is valid. #….. The Qurbaani of oxen is permissible and the same applies to cows but it is conditional for them to be two years old. 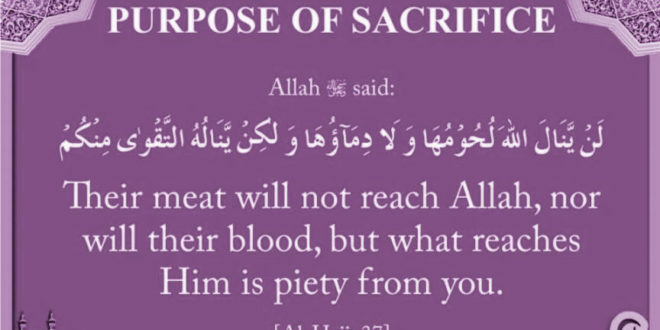 If this happens in the case of some poor person, it will be Waajib for him to sacrifice both the animals because Qurbaani is not Waajib on such a poor person but since he purchased an animal for Qurbaani, it has now become Waajib upon him and since he purchased two animals with this intention, sacrificing both have now become Waajib upon him. #….. If an animal was purchased for Qurbaani and another animal had to be given instead, because of the animal been exchanged,the second animal should not be less in value than the first. If the second animal was bought for less than the value of the first animal, the difference in value must be given away as Sadaqah. A goat: One year old. A cow, buffalo or ox: Two years old. A camel: Needs to be five years old. If the animals for Qurbaani are younger than this, their Qurbaani will not be permissible. #….. If a ram or ewe, male and female sheep, is older than six months but less than a year old but is so fat and healthy that it appears to be a year old and if left among year old rams and ewes, it does not appear to be younger than them, Qurbaani of such an animal is also permissible. If it is less than six months old, its Qurbaani is not permissible even though it is very healthy and fat. This rule of being less than a year applies only to sheep, rams and ewes. #….. If an animal falls short by a day or so in reaching the one year mark, its Qurbaani will not be valid. #….. If an animal appears to be under age but it is known with certainty that it has reached the appropriate age, its Qurbaani will be valid.